Nature’s C Complex offers you a natural and powerful Vitamin C boost in a convenient vegan capsule. The vitamin C sources include acerola cherry, organic oranges, blueberries and cranberries! 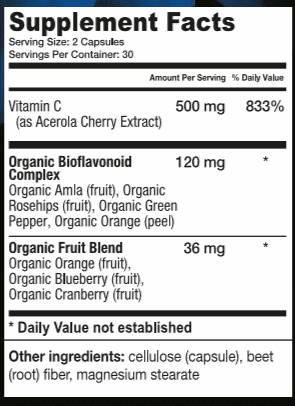 Additionally, you receive bioflavonoid’s such as organic amal fruit, organic rosehips & organic green pepper. 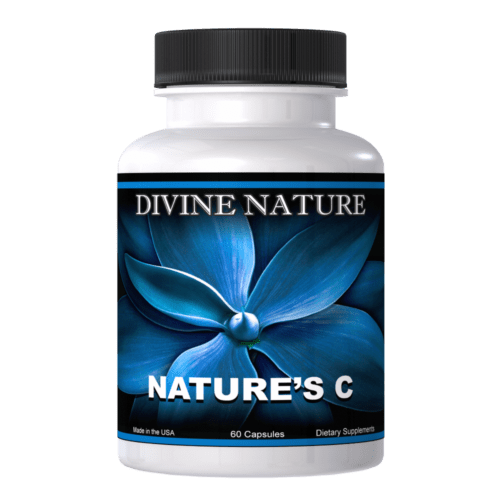 You can now receive all of the benefits of true Vitamin C from the most powerful and complete whole food vitamin C supplement ever developed, Nature’s C Complex! 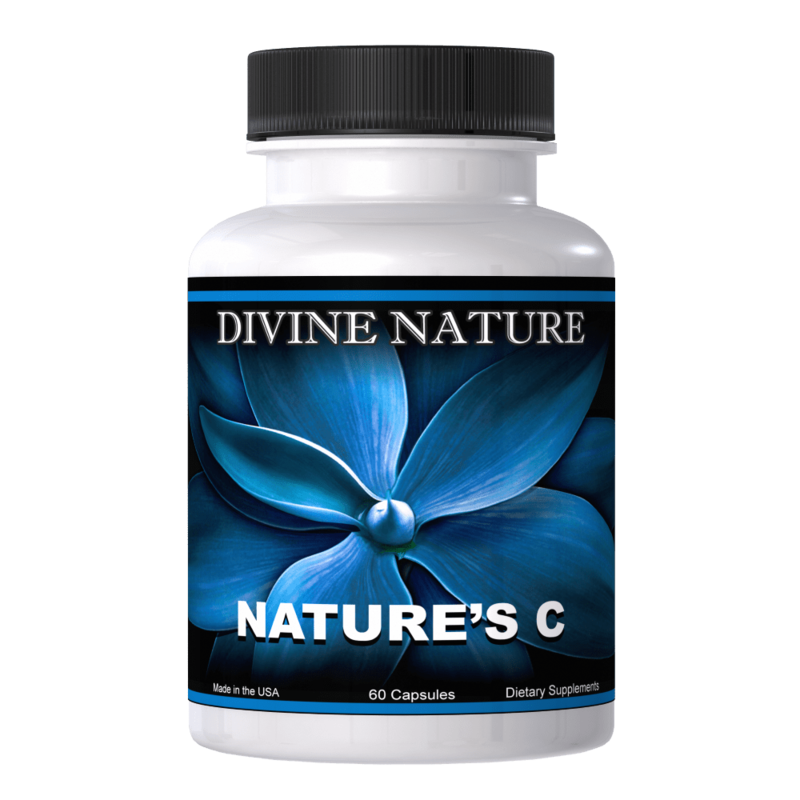 Nature’s C Complex delivers a high potency amount of vitamin C from organic whole food sources. 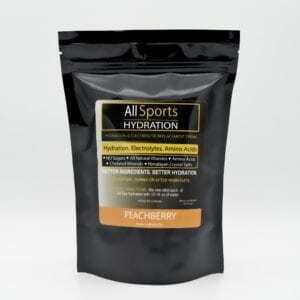 It contains the highest quality of unprocessed fruits, fruit juices & flavonoids. Nature’s C Complex is not processed to separate any of the whole food constituents. Very low temperatures are used as well in the dehydration of the fruits in order to optimize nutrient and enzyme content. Vitamin C acts as an antioxidant, anti-inflammatory agent, assists in collagen formation, boosts the immune system and is necessary in the synthesis of stress hormones. Additionally, Vitamin C allows other vitamins and minerals to become more absorbent in the body! If you go shopping for vitamin C at your local health food store or grocery store, you will see as you begin to pick up the different bottles that almost 100% of the vitamins sold to the consumer are vitamins that come from a synthetic (chemical) source. 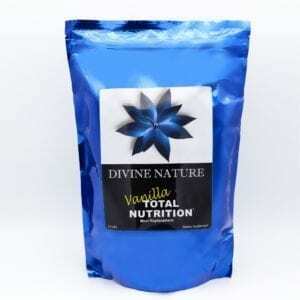 This means that the label will read “Vitamin C as Ascorbic Acid or Ascorbate” as the main ingredient. Contrary to what most pharmaceutical companies or health companies want you to believe, ascorbic acid is not whole- Vitamin C. Ascorbic acid is only a fraction of the factors that make up a whole food vitamin C. Without the other factors or components, such as Bioflavonoid, Rutin and J & K factors, vitamin C is incomplete and thus forces the body to seek out from its own reserves of these nutrients to complete the vitamin C complex before absorption can take place. This actually depletes vitamin C from the body and can cause harmful effects. The companies that sell you ascorbic acid as vitamin C make this up synthetically in a laboratory instead of extracting them from the whole food to save money. Ascorbic acid is very easy and inexpensive to mix together. It is comprised of two basic ingredients: corn syrup and hydrochloric acid. Yes! It is true, ascorbic acid (ascorbate) is literally corn syrup and hydrochloric acid bound together! Imagine what happens inside of your arteries and capillaries when day after day they are loaded with corn syrup. In 2000, an article was published in the “Los Angeles Times” on March 3rd by Terrence Monmaney. The article cited a university study that had recently been finished by the lead University of Southern California researcher, epidemiologist James Dwyer, of the Keck School of Medicine. A study was done with a group of 573 men and women. Those who had consumed the most vitamin C from pills over a year and a half had more evidence of possible future atherosclerosis, or hardening of the arteries, compared to those who did not take vitamin C pills. To gauge the vitamin C effects, researchers performed ultra sound measurements of the subject’s carotid arteries, which are in the neck. This method is a medically accepted substitute for probing coronary arteries directly. Using just half of the recommended RDA amount of 1000 mg. per day, the study was performed by using just 500 mg per day of vitamin C “as ascorbic acid” for six months. Ultra sounds were then performed a second time and the results showed that after consuming only 500 mg a day, the inner artery wall layer was 2.5 times thicker than that of those that did not take any of the synthetic vitamin C. Among smoking supplement takers, the inner artery walls were 5 times thicker. Physicians say such thickening precedes atherosclerosis. What the article failed to point out however is that true whole food vitamin C is very beneficial as an antioxidant. 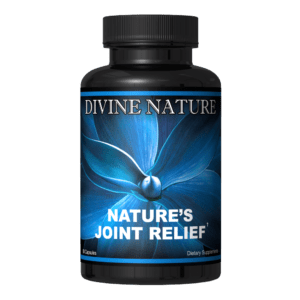 It assists in collagen formation, boosts the immune system and is necessary in the synthesis of stress hormones. Millions of Americans like those in the study are consumers of ascorbic acid and corn syrup type “Vitamin C,” thus being recipients of the harmful and negative side effects. Why is it then that if by taking these partial and incomplete vitamins, which are known to have side effects, do these companies continue to sell them to the public? The answer is “Profits.” Health companies and pharmaceutical companies can make larger profits by selling cheap imitations of vitamin C and other supplements. 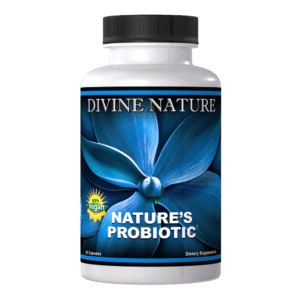 Fortunately, you will not find those same synthetic ingredients in Divine Nature’s Whole Food Vitamin C Complex. The vitamin C sources include acerola cherry, organic oranges, blueberries and cranberries! Additionally, you receive bioflavonoid’s such as organic amal fruit, organic rosehips & organic green pepper. 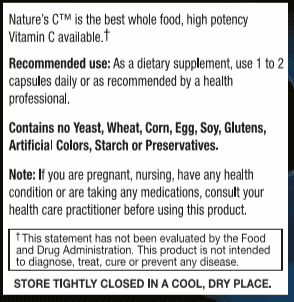 You can now receive all of the benefits of true Vitamin C from the most powerful and complete whole food vitamin C supplement ever developed, Nature’s C. You can now receive all of the benefits of true Vitamin C from the potent and most complete whole food vitamin C supplement ever developed, Nature’s C Complex! Recommended Dosage: Take 1 to 2 capsules daily with meals.